With the weather unusually wet - we have had a wetter autumn than I have experienced for many years - I decided to dig the tuberous vegetables early so I don't risk them rotting in the ground. There have been some disappointments and hope. The arracacha plants have grown huge and I was really looking forward to eating them this year. 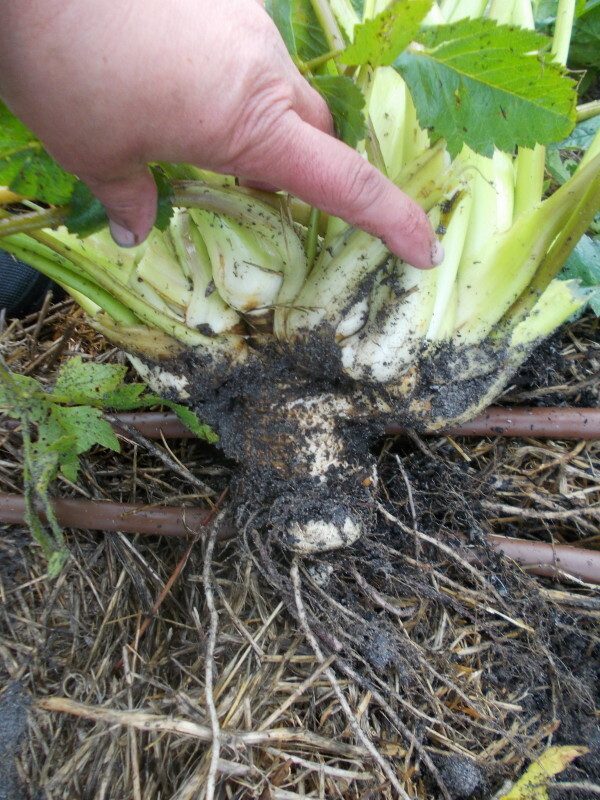 Unfortunately when I dug them I found that they had not made any roots. It seems weird to me as I would have thought they needed large roots to support the nutritional needs of all that foliage. 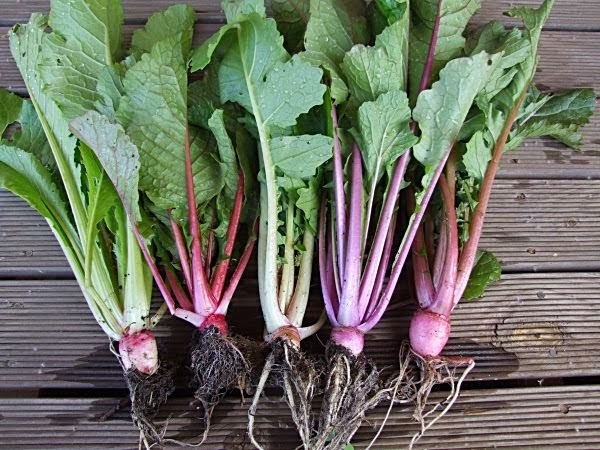 This is the first time I have grown them in the seed block so I guess that it is a nutritional/soil problem that I will have to work out. At least I will have plenty of divisions to plant out. This is good as I nearly lost all my plants last year in the flooding. 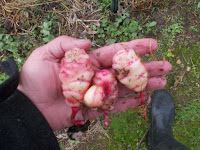 Yesterday it was foggy most of the day and I didn't feel like getting wet while weeding so I decided to dig my oca. 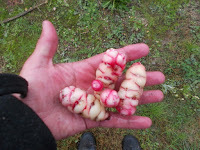 They had not died down fully yet so the tubers were not as large as they should be but I was starting to see some slug and mouse damage and I didn't want to take a risk seeing as how I lost nearly all my varieties last year and had a very poor seed germination this season. I mostly only had the few tubers I saved. 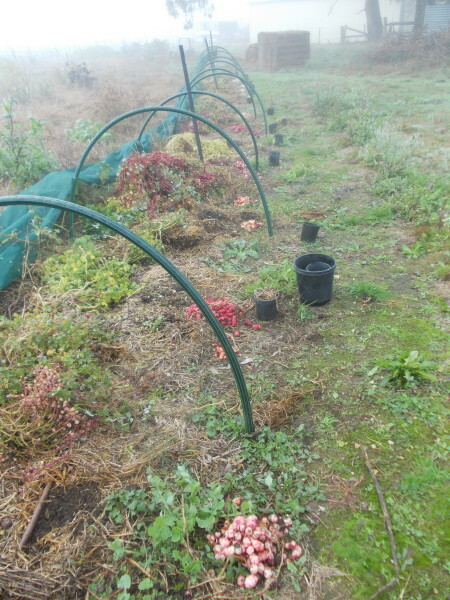 Out of the 33 varieties I planted 9 died of stem rot and I kept 11 of the best producers. I also had 4 that were heat tolerant but only kept the two of those that produced ok. The summer was pretty mild this year which is probably why more did not get stem rot. Next summer will be the real test. The four top pictures on the left are of some that I kept. 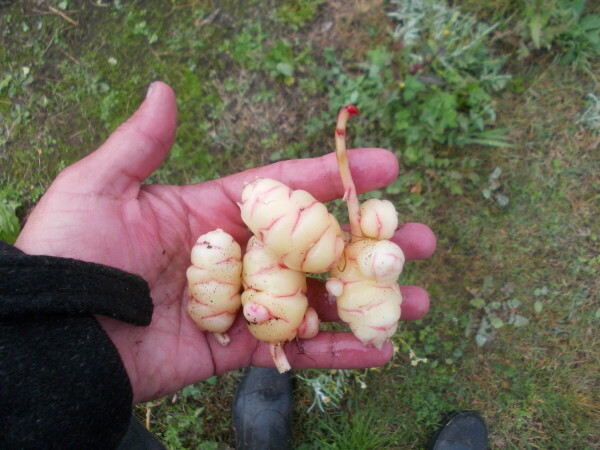 These plants not only produced decent sized tubers (which would have been bigger if I had left them another couple of weeks) but also produced around a kilo of tubers. I will plant a heap more seed next spring in the hope that I get another nearly black tubered one that I lost last year. 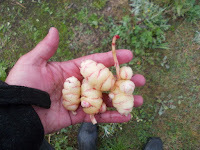 This last pic shows a few tubers of plants that I tossed. 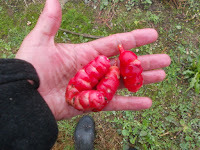 These plants mostly produced badly, had small tubers, or did not grow well. 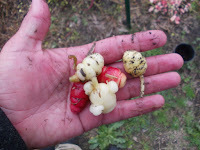 I did have one variety that grew into huge bushes but didn't produce many tubers which was sad to toss out, but was a waste of space. I have left one plant in the ground that is so far showing no sign of frost damage or dying down so I will leave it to see what it does.